1997-2006 Wrangler (TJ/LJ) Textured Black XRC Light Bar - Windshield Top Smittybilt (76910). XRC Windshield Light Bar by Smittybilt. 5 Light Tabs. Light up the night for safer wheeling in the dark with this windshield light bar. It has tabs for 5 up to 9" diameter lights or you can mount a 50" LED light bar. The dual stage textured black powdercoated 1.5" diameter steel tube is fully adjustable and attached to cold rolled steel side supports that mount to the factory windshield frame brackets. This light bar comes with hardware and instructions for an easy installation, with no drilling required. 2003-2006 Silverado 2500HD Gloss Black Street Light Bar Smittybilt (110010). Street Light Bar by Smittybilt®. 4 Light Tabs. The Street Light Bar provides a fast and easy way to add lighting to the front of your truck. The 1.25" diameter 0.095" wall thickness steel tubing is designed to follow the contours of your front bumper for a custom look, and includes 4 tabs that can mount up to a 9" diameter light. The angled shape is designed for easy installation and the high-gloss powdercoated finish will enhance appearance and remain durable for years to come. The Street Light Bar comes with all hardware and instructions for installation, which may require drilling depending on application. 2003-2006 Silverado 3500HD Gloss Black Street Light Bar Smittybilt (110010). Street Light Bar by Smittybilt®. 4 Light Tabs. The Street Light Bar provides a fast and easy way to add lighting to the front of your truck. The 1.25" diameter 0.095" wall thickness steel tubing is designed to follow the contours of your front bumper for a custom look, and includes 4 tabs that can mount up to a 9" diameter light. The angled shape is designed for easy installation and the high-gloss powdercoated finish will enhance appearance and remain durable for years to come. The Street Light Bar comes with all hardware and instructions for installation, which may require drilling depending on application. 2007-2013 Silverado 1500 Gloss Black Street Light Bar Smittybilt (110040). Street Light Bar by Smittybilt. 4 Light Tabs. The Street Light Bar provides a fast and easy way to add lighting to the front of your truck. The 1.25" diameter 0.095" wall thickness steel tubing is designed to follow the contours of your front bumper for a custom look, and includes 4 tabs that can mount up to a 9" diameter light. The angled shape is designed for easy installation and the high-gloss powdercoated finish will enhance appearance and remain durable for years to come. The Street Light Bar comes with all hardware and instructions for installation, which may require drilling depending on application. 2007-2010 Silverado 2500HD Gloss Black Street Light Bar Smittybilt (110050). Street Light Bar (110050) by Smittybilt®. 4 Light Tabs. The Street Light Bar provides a fast and easy way to add lighting to the front of your truck. The 1.25" diameter 0.095" wall thickness steel tubing is designed to follow the contours of your front bumper for a custom look, and includes 4 tabs that can mount up to a 9" diameter light. The angled shape is designed for easy installation and the high-gloss powdercoated finish will enhance appearance and remain durable for years to come. The Street Light Bar comes with all hardware and instructions for installation, which may require drilling depending on application. 2007-2010 Silverado 3500HD Gloss Black Street Light Bar Smittybilt (110050). Street Light Bar (110050) by Smittybilt®. 4 Light Tabs. The Street Light Bar provides a fast and easy way to add lighting to the front of your truck. The 1.25" diameter 0.095" wall thickness steel tubing is designed to follow the contours of your front bumper for a custom look, and includes 4 tabs that can mount up to a 9" diameter light. The angled shape is designed for easy installation and the high-gloss powdercoated finish will enhance appearance and remain durable for years to come. The Street Light Bar comes with all hardware and instructions for installation, which may require drilling depending on application. 2014-2014 Silverado 1500 Gloss Black Street Light Bar Smittybilt (110080). Street Light Bar (110080) by Smittybilt®. 4 Light Tabs. The Street Light Bar provides a fast and easy way to add lighting to the front of your truck. The 1.25" diameter 0.095" wall thickness steel tubing is designed to follow the contours of your front bumper for a custom look, and includes 4 tabs that can mount up to a 9" diameter light. The angled shape is designed for easy installation and the high-gloss powdercoated finish will enhance appearance and remain durable for years to come. The Street Light Bar comes with all hardware and instructions for installation, which may require drilling depending on application. 2014-2014 Sierra 1500 Gloss Black Street Light Bar Smittybilt (110080). 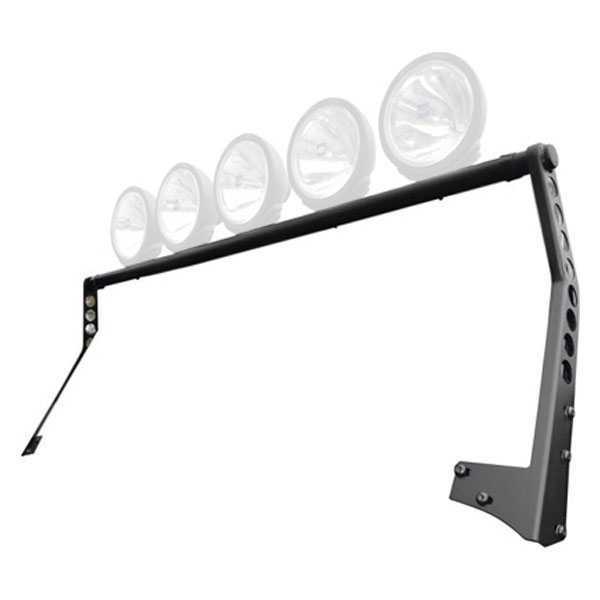 Street Light Bar (110080) by Smittybilt®. 4 Light Tabs. The Street Light Bar provides a fast and easy way to add lighting to the front of your truck. The 1.25" diameter 0.095" wall thickness steel tubing is designed to follow the contours of your front bumper for a custom look, and includes 4 tabs that can mount up to a 9" diameter light. The angled shape is designed for easy installation and the high-gloss powdercoated finish will enhance appearance and remain durable for years to come. The Street Light Bar comes with all hardware and instructions for installation, which may require drilling depending on application. 2002-2008 Ram1500 Gloss Black Street Light Bar Smittybilt (120010). Street Light Bar (120010) by Smittybilt®. 4 Light Tabs. The Street Light Bar provides a fast and easy way to add lighting to the front of your truck. The 1.25" diameter 0.095" wall thickness steel tubing is designed to follow the contours of your front bumper for a custom look, and includes 4 tabs that can mount up to a 9" diameter light. The angled shape is designed for easy installation and the high-gloss powdercoated finish will enhance appearance and remain durable for years to come. The Street Light Bar comes with all hardware and instructions for installation, which may require drilling depending on application. 2009-2015 Ram1500 Gloss Black Street Light Bar Smittybilt (120020). Street Light Bar by Smittybilt. 4 Light Tabs. The Street Light Bar provides a fast and easy way to add lighting to the front of your truck. The 1.25" diameter 0.095" wall thickness steel tubing is designed to follow the contours of your front bumper for a custom look, and includes 4 tabs that can mount up to a 9" diameter light. The angled shape is designed for easy installation and the high-gloss powdercoated finish will enhance appearance and remain durable for years to come. The Street Light Bar comes with all hardware and instructions for installation, which may require drilling depending on application. 2004-2013 Ram2500 Gloss Black Street Light Bar Smittybilt (120030). Street Light Bar by Smittybilt. 4 Light Tabs. The Street Light Bar provides a fast and easy way to add lighting to the front of your truck. The 1.25" diameter 0.095" wall thickness steel tubing is designed to follow the contours of your front bumper for a custom look, and includes 4 tabs that can mount up to a 9" diameter light. The angled shape is designed for easy installation and the high-gloss powdercoated finish will enhance appearance and remain durable for years to come. The Street Light Bar comes with all hardware and instructions for installation, which may require drilling depending on application. 2004-2013 Ram3500 Gloss Black Street Light Bar Smittybilt (120030). Street Light Bar by Smittybilt. 4 Light Tabs. The Street Light Bar provides a fast and easy way to add lighting to the front of your truck. The 1.25" diameter 0.095" wall thickness steel tubing is designed to follow the contours of your front bumper for a custom look, and includes 4 tabs that can mount up to a 9" diameter light. The angled shape is designed for easy installation and the high-gloss powdercoated finish will enhance appearance and remain durable for years to come. The Street Light Bar comes with all hardware and instructions for installation, which may require drilling depending on application. 2004-2008 F150 Gloss Black Street Light Bar 4 Tab Smittybilt (130010). Street Light Bar by Smittybilt. 4 Light Tabs. The Street Light Bar provides a fast and easy way to add lighting to the front of your truck. The 1.25" diameter 0.095" wall thickness steel tubing is designed to follow the contours of your front bumper for a custom look, and includes 4 tabs that can mount up to a 9" diameter light. The angled shape is designed for easy installation and the high-gloss powdercoated finish will enhance appearance and remain durable for years to come. The Street Light Bar comes with all hardware and instructions for installation, which may require drilling depending on application. 1999-2007 F250 Super Duty Gloss Black Street Light Bar Smittybilt (130020). Street Light Bar by Smittybilt. 4 Light Tabs. The Street Light Bar provides a fast and easy way to add lighting to the front of your truck. The 1.25" diameter 0.095" wall thickness steel tubing is designed to follow the contours of your front bumper for a custom look, and includes 4 tabs that can mount up to a 9" diameter light. The angled shape is designed for easy installation and the high-gloss powdercoated finish will enhance appearance and remain durable for years to come. The Street Light Bar comes with all hardware and instructions for installation, which may require drilling depending on application. 1999-2007 F350 Super Duty Gloss Black Street Light Bar Smittybilt (130020). Street Light Bar by Smittybilt. 4 Light Tabs. The Street Light Bar provides a fast and easy way to add lighting to the front of your truck. The 1.25" diameter 0.095" wall thickness steel tubing is designed to follow the contours of your front bumper for a custom look, and includes 4 tabs that can mount up to a 9" diameter light. The angled shape is designed for easy installation and the high-gloss powdercoated finish will enhance appearance and remain durable for years to come. The Street Light Bar comes with all hardware and instructions for installation, which may require drilling depending on application. 2008-2010 F250 Super Duty Gloss Black Street Light Bar Smittybilt (130040). Street Light Bar by Smittybilt. 4 Light Tabs. The Street Light Bar provides a fast and easy way to add lighting to the front of your truck. The 1.25" diameter 0.095" wall thickness steel tubing is designed to follow the contours of your front bumper for a custom look, and includes 4 tabs that can mount up to a 9" diameter light. The angled shape is designed for easy installation and the high-gloss powdercoated finish will enhance appearance and remain durable for years to come. The Street Light Bar comes with all hardware and instructions for installation, which may require drilling depending on application.